All kilns are made to order and may take 8-9 weeks from the manufacturer depending on make and model, unless otherwise stated "in stock at store" on that particular model. Please contact us for fusedglasswarehouse time frame, shipping costs and pallet charges, if applicable. Why Pay More When You Can Pay Less at FusedGlassWarehouse! How to pick a Glass Kiln??? Freight charges WILL NOT be calculated in the shopping cart. For an accurate freight quote, please call or email. 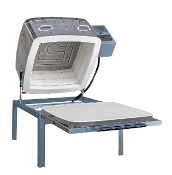 Prices on shipping email your kiln # and address. Kilns come with tall stand, peephole plug, lid wedge, instruction manual, and warranty card. Two-year warranty.